We found out in week 23 (just over halfway through) that our baby had what is known as a Single Umbilical Artery (SUA) - the normal umbilical cord has 2 arteries and 1 vein, but an SUA baby only has a single artery. That means the baby has only half the blood vessels from the placenta providing nutrients. This is not that rare, with approximately 0.5 - 1% of births exhibiting it - and is indeed more common in multiple births. Whilst not rare, the outcomes can be quite life-determining for the young baby. Despite this the SUA complication is not something that you hear that much (if at all). There's no clear cause for SUA - and appears just to happen sometimes. Perhaps it's only the advent of high resolution doppler ultrasound that it's been routinely identified during antenatal tests. Thankfully our ultrasound had also shown no other problem indicators. The difficulty with SUA babies, is that the odds of birth defects suddenly jumps up to between 25-30% of all live births. That's getting pretty damn close to 1 in 3... and at those odds, Russian Roulette is actually better odds. Of course, for 70-75% of SUA babies, there's no apparent problems, and life goes on as normal. The biggest risk is that the baby will be exhibit intrauterine growth restriction resulting in a very small baby - and with issues similar to premature babies. Fast forward one week later (almost) and C-chan was finally born after about 5.5-6 hours of labour... and I have to admit completely without our obstetrician who was stuck in theatre for an operation. To our complete and utter relief C-chan looked a happily healthy (and loud) baby girl when she finally arrived. A few minutes later (after some important time lying on mum's chest), they did the measurements. It turned out... amazingly.... C-chan was a very, very healthy 3,530 grams. The last scan had been a complete error! In fact, C-chan was even 10 grams heavier than her older brother L-kun had been at birth. Indeed, subsequent paediatrician check-ups and a fairly difficult ultrasound later (to check kidneys, as SUA babies have 5-15% chance of having problems with kidneys) seemed to show no problems at all. I have to admit, to this day, I wish we had not had to have gone through that last week believing that she was going to be born small. Still - for us, it seems that everything had turned out well (fingers crossed), and that C-chan will enjoy a totally normal healthy life. 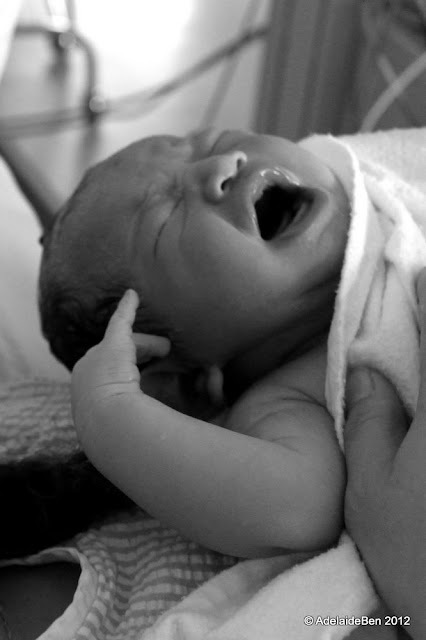 For many families having an SUA baby however, the story is quite different - and far from happy. My advice is that if you find out that you're baby is SUA, don't panic. Be positive. I know that's not easy to do when you first find out. There's little that can be done except wait... indeed that's perhaps the worst part of it. You can of course ask for a re-scan if in doubt, and there are a couple of invasive tests that should be avoided if you can help it - which may tell you if there's a chromosonal cause to the SUA. There's much however to be said for living with hope, not dread, in your heart as your baby grows in the womb. My other advice is that if you learn you have an SUA baby, be very careful how much time you spend on the internet... as there are countless horrible accounts to keep you sleepless at night. Really scary stories - which I'm not going to repeat here (you don't need the negatives to be reinforced). The positive stories like this one don't have any where near the impact as the negative ones. If in doubt, speak to your obstetrician. Early. Though don't necessarily take their first answer as the end of it. And remember - don't concentrate on the odds. This is not about being lucky or unlucky. It's not your fault that you're in this situation, and there's little that you can actively do except to be strong. You'll need it for both yourself, your partner and your children. Life, precious as it is, is also precarious. Cherish it. Well, as those that are familiar with this blog, you already know that I've been posting a whole heap less these days, and for good reason. T-chan and I have been expecting the arrival of our second child. And I am very happy to announce that she arrived (only 3 days ahead of schedule), and both baby and mother are very fine. I'll go into all the weights and measures (for people seem to want to know these things) in the next post. And as parents, we are amazed just how similar she was to her bigger brother, L-kun... they could almost have been twins (separated only by a mere 5 years)... and a few bits different of course. For those that are also familiar with my blog, you'd realise that it wouldn't be right unless we had a code-name for our little bundle of joy... so let me introduce you to C-chan. By the way, if you've ever wondered about the -chan part it, it's a Japanese honorific, or 'diminutive suffix'. It's used quite simply when expressing your love/care for that person (and in Japanese society that means close relationships, or more commonly for children). Our sons blog name is L-kun, which is typically used for boys (or younger men). Whilst -chan itself is unisex, it's more associated with girls. Now, T-chan's parents arrived last week, and we've been on tenterhooks ever since then, expecting the birth any and every day. Of course, I've been going to work, but I didn't really believe I'd be getting any phone calls during the day. Just didn't seem that was the way it was going to happen. Then, of course, things rarely work the way you think they will. Therefore on queue whilst I was at work, I received a phone-call from my wife to say that she had pains, every 3-4 minutes. 3-4 minutes!... our obstetrician had said we should head to the hospital at 10 mins. By the time I had driven home from work which is about 25-30 mins away (almost running out of petrol on the way... and I mean ALMOST), picked up my wife and detoured to the obstetrician's office. Yes... she was in labour, and yes, we should get to the hospital ASAP. Only another 3 hours later, and our baby girl, C-chan, was born. Not bad - L-kun had taken 15+ hours with 2 hours of pushing, whilst C-chan was born in a speedy 5.5 - 6 hours with 30 mins pushing. No time for messing around! The other great thing was that this time around, T-chan's body was not as distressed either... indeed the next day she was happily walking around the hospital, complaining how boring it was. And after a grumbly first night, C-chan was an excellent newborn (feeding and sleeping very easily). She discharged after the third night, happy to get home and to establish that rhythm of life. Of course - what happens in hospital doesn't always translate to homelife... and we've now had two nights of very little sleep. I suppose it couldn't all be roses and lollipops... but every moment of sleep deprivation is a happy, if tiring (and sometimes stressful) reminder of how lucky we have been. Now I have to admit that my wife, T-chan, has been not so secretly hoping for a girl - and it came as a huge relief when we found out that there was a more than 50% chance that our baby was going to be a girl at the 19 week ultra-sound. Of course, sonographers are a cagey lot, and don't tend to go out on a limb too readily (lots of rooms, and wardrobes, may need to be re-decorated if they get it wrong). But we were confident that we were having a girl... BINGO! We were right! 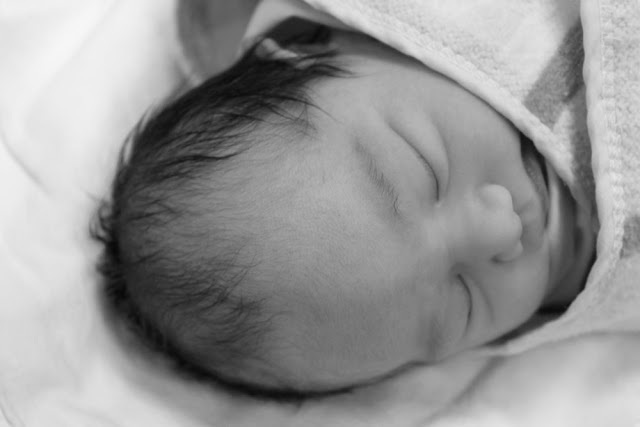 Welcome to the world, C-chan!